From left, CRPG Architects director McFadzean, CHAP managing director Douglas Thomson and Parklands Group managing director Ron Taylor. 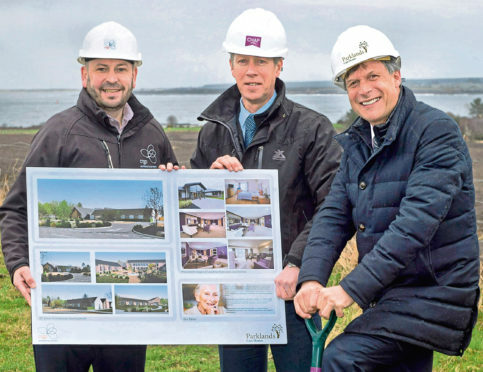 Building work will start next month on the 40-bed unit, which is due to open in Fortrose in spring 2020, creating 50 full-time-equivalent jobs. The Black Isle home will be Buckie-based Parklands’ ninth. Chap also built its £4.5m home in Grantown, which opened last September. Parklands managing director Ron Taylor said: “Our new Grantown care home is a superb addition to the group and residents are very much enjoying it. “We look forward to working with Chap to deliver an equally impressive care home for Fortrose. This will be our ninth care home and a further sign of our continued investment in the Highlands. Chap joint-managing director Douglas Thomson said: “Chap Group are delighted to continue the successful relationship with Parklands. The Fortrose care home has been designed by Inverness architects CRGP. Bryan McFadzean, director, CRGP, said: “We have worked closely with Parklands and the Highland Council to design a building which is equipped to provide 21st century care but is nevertheless sensitive to its rural setting near an historic conservation area. In December, Parklands announced it had received £5 million from investment company BGF, formerly known as the Business Growth Fund, to help accelerate company growth. The firm plans to open a new £6.5m care hub in the Milton of Leys area of Inverness, comprising a 48-bed home and 16 assisted living suites. Work on the project, which will create around 100 jobs, is expected to get started this coming summer.